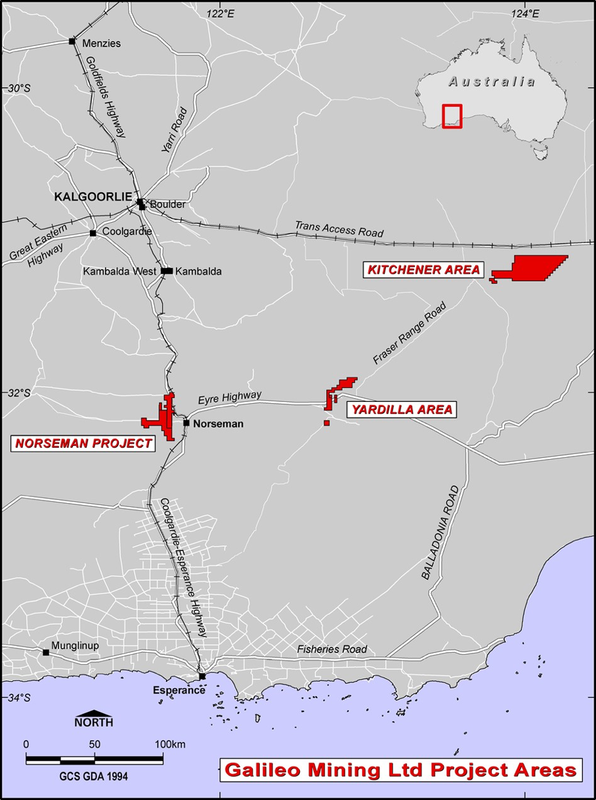 The Norseman Project comprises a series of tenements comprising Exploration and Prospecting Licences totalling 276.8 km2 in area centred 13 km west-northwest of the gold-mining town of Norseman. Norseman is on the junction of the Coolgardie–Esperance Highway and the Eyre Highway, and is 726 km east of Perth and 189 km south of Kalgoorlie. The project occurs in an infrastructure-rich region with a gas pipeline, water pipeline, sealed highway to major regional centres of Kalgoorlie and Esperance, railway and the small regional town of Norseman all within a short distance. The Norseman Project tenements predominantly overlie Archaean rocks of the Mt Kirk Formation, located at the southern end of the Norseman-Wiluna greenstone belt. The Mt Kirk Formation comprises a sequence of metamorphosed peridotite, pyroxenite, sediments, and mafic and acid volcanics. Within the tenement area, the Mt Kirk Formation is intruded by two major mafic-ultramafic differentiated sills, the Mt Thirsty Sill and the Mission Sill. The principal feature of the Norseman Project is cobalt, nickel and manganese oxide mineralisation overlying the Mt Thirsty Sill and Mission Sill forming a blanket-style deposit from in situ, lateritic weathering of olivine-rich peridotite rocks. Mineral Resources for cobalt have been estimated for Mt Thirsty and Mission Sill and are reported here. Metallurgical concept studies have shown a potential processing route for cobalt extraction using agitated vat leaching with SO2 as a reagent. Potential to add to the cobalt resource inventory has been identified on the basis of airborne magnetic signatures indicating favourable bedrock, mapped laterite at surface and in some cases historic drilling and geochemistry. Extensive sections of the Mt Thirsty and Mission Sill ultramafic sills along strike of the lateritic mineralised zones on Galileo ground have not been drilled. The occurrence of potentially mineralised lateritic regolith is indicated where bedrock is not exposed at surface. Six locations prospective for lateritic Co are shown as prospects on the map, which have been identified on the basis of an airborne magnetic signature indicating favourable bedrock, mapped laterite at surface and in some cases historic drilling and geochemistry. PGM mineralisation occurs at two locations in metamorphosed pyroxenites and peridotites of the Mission Sill, expressed at surface as a series of Pd-Pt anomalies. The surface anomalies are underlain by anomalous concentrations of Pd-Pt in saprolite, and occurrences within fresh bedrock beneath. The occurrences warrant further exploration. PGM mineralisation occurs in metamorphosed pyroxenites and peridotites of the Mission Sill, expressed at surface as a series of Pd-Pt soil anomalies over an approximately 6 km strike. The Pd anomalies are the most prominent, reaching up to 500 x 300 m in size and up to 1.1 ppm Pd in magnitude. The occurrences are named Unicorn (associated with the Mission Sill Co resource) and Dragon (Mission Sill South) (Norseman Project Map). Soil anomalies are underlain by a blanket-type mineralisation in saprolite. Maximum drill results in the residual regolith at Dragon were 20 m @ 1.3 ppm Pd and 0.83 ppm Pt from 30 m in MTRC112. Higher grades of Pt and Pd were intersected in fresh bedrock at Unicorn with 1 m @ 4.5 ppm Pd and 1.2 ppm Pt from 92 m in drill hole MTRC128. Notably, coherent Pd-Pt soil anomalies generally reflect positions where mineralisation has been detected in weathered and fresh rock below (Figure 6), indicating the efficacy of soil sampling for exploration. Table 5 shows selected drill intersections at Unicorn and Dragon. Scanning electron microscope work has identified native palladium and sperrylite (PtAs2) in samples from MTRC128 (Unicorn prospect). Qualitative work by MPS has likewise shown that palladium and platinum minerals are present as discrete minerals. The implication from this work is that the palladium and platinum could be economically recoverable should they occur in quantities sufficient for economic extraction. Available geochemical and mineralogical data point towards a sulphide-type PGE mineralisation model which commonly occurs in stratabound Ni-Cu-sulphide- and chromite-bearing beds within layered mafic-ultramafic intrusive sequences. 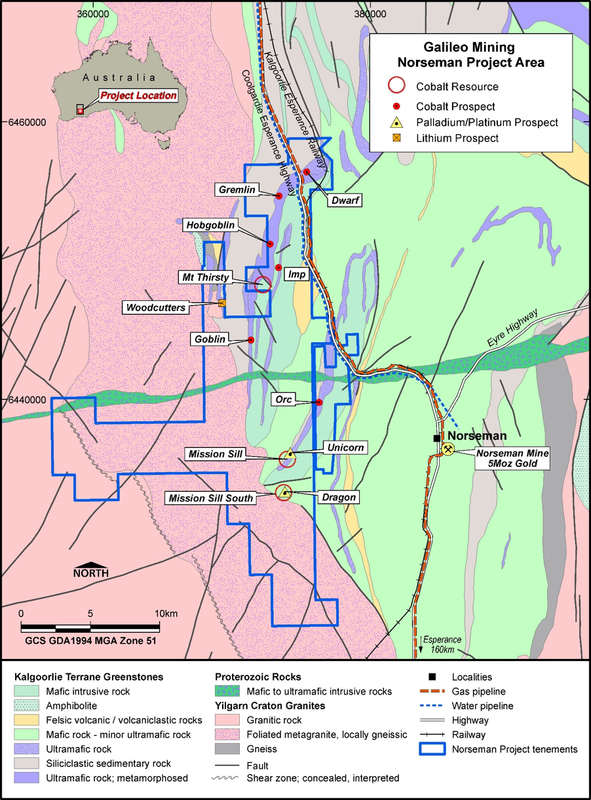 The area is prospective for both supergene and primary PGE mineralisation. Further drill testing is warranted based on the currently developing geological model for the area. Additional exploration potential is provided by lithium-cesium-tantalum (LCT) bearing pegmatites at Woodcutters prospect. 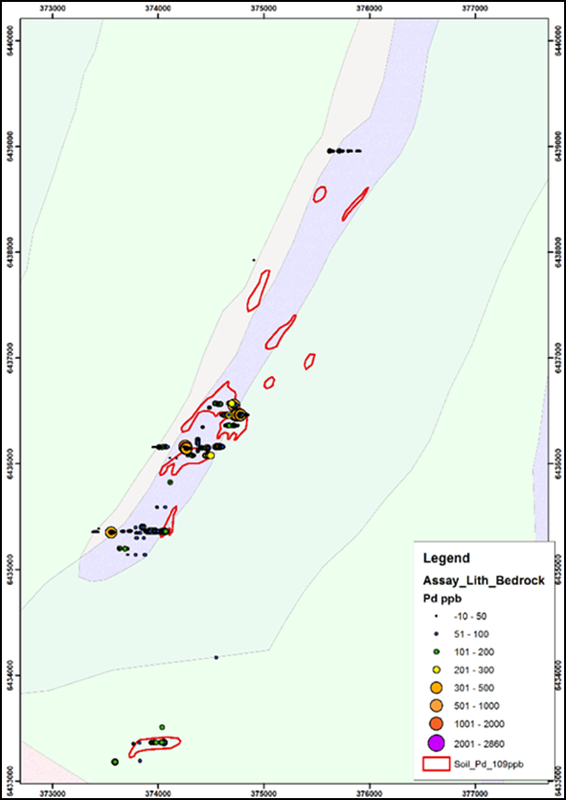 A series of steeply dipping, north-south trending pegmatites has been mapped and sampled at Woodcutters, located 3 km west of the Mt Thirsty Co mineralised area (Norseman Project Map). The pegmatites are hosted in mafic schist and extend discontinuously over a strike length of 2 km. Pegmatites average 6 to 10 m thick, and the maximum thickness mapped is 16m. Six grab samples of micaceous (lepidolite) pegmatite gave an average assay of 2.3% Li2O with a range from 1.4% to 3.9%. The samples are correspondingly high in Rb (range 1.21% to 3.0%, average 1.87% Rb) and Ta2O5 (75 ppm to 917 ppm, average 476 ppm). Exploration potential exists for nickel sulphides along the western margin of the Mt Thirsty Sill. Drilling in 2010 by the Barra/Conico JV on the western margin of the Mt Thirsty Sill (1 km south of the Galileo tenement containing the Mt Thirsty resource) identified nickel sulphides at the base of a komatiite flow. Grades up to 6m @ 3.4% and 2m @ 5.9% nickel were intersected. The corresponding stratigraphy in the Galileo ground has never been tested and potential therefore exists for similar style nickel sulphide mineralisation on the Galileo ground. A Moving Loop Electro Magnetic (MLEM) survey was undertaken for Galileo in 2013 aimed at identifying conductors associated with nickel sulphides within the komatiite sequence. This survey (over 7.1 km north-south) covered half of the prospective strike length held by Galileo. Four drill targets possibly related to sulphides were delineated within the Galileo tenement, which are yet to be tested by drilling. The Company aims to target these areas through first pass drilling in the case of the lithium-tantalum prospect and surface geophysics followed by drilling, if warranted, for the nickel sulphide prospect. The Company has 15 Tenement applications within the Norseman Project. If and when the Tenements are granted, the Company plans to undertake reconnaissance aircore drilling over areas of the licenses deemed to be prospective for cobalt mineralisation.